Banded Garden Spiders – Argiope trifasciata become very active toward the middle of August here in Illinois. They actually hatch and mature in early summer, but stay mainly out of sight until they are big enough to build their signature web, and set about the business of mating and egg-laying. Leg span as pictured = 35mm (1-3/8?) – somewhat smaller than Argiope aurantia. Humpback Orb Weaver Spider – Eustala sp. 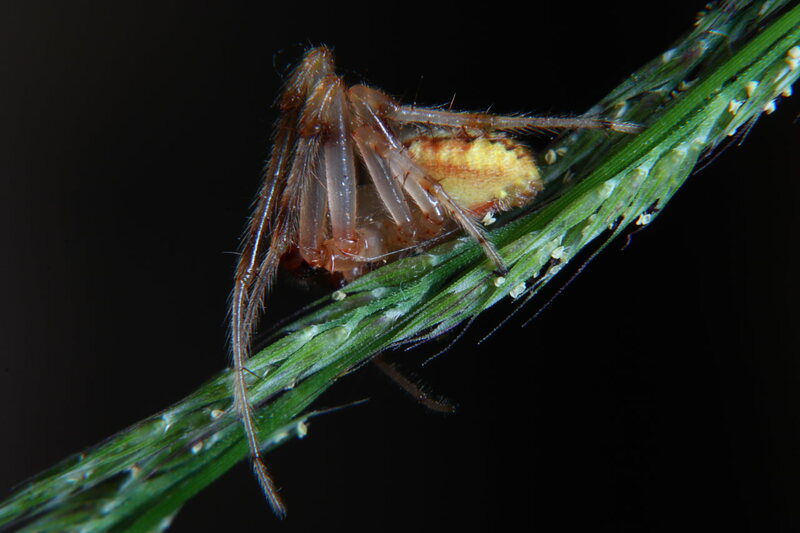 This tiny (5mm) unfortunate spider had become host to some sort of parasitic larva – you can see the white, worm-shape on top of the cephalothorax under the overhang of the abdomen. Click the link for the full story of the nasty worm. Cross Spider – Araneus diadematus Live female spider photographed at Wheaton, Illinois. Size: 18mm. The species epithet diadematus refers to a diadem, “A jeweled crown or headband worn as a symbol of sovereignty.” It’s easy to see the resemblance of the abdominal markings to a crown worn by English royalty, or at least royalty adhering to the Christian faith. Unto you a Child is born. Furrow Spider – Larinioides cornutus mature female above = 12mm. 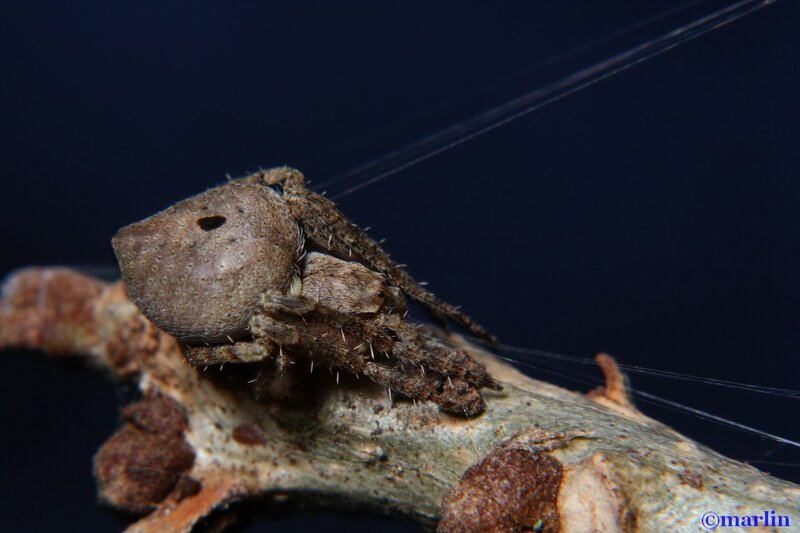 This orb-weaver, commonly called the furrow or foliate spider, is very common on human structures, especially under eaves and porches. 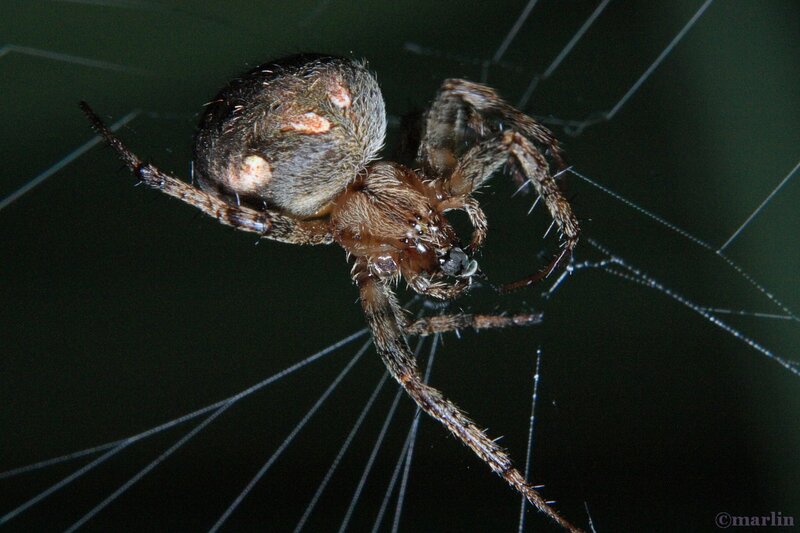 They live on my back porch by the dozens, males and females alike in their smallish-orb webs. Unlike their larger sisters amongst the weeds, these beautiful little rascals are strictly nocturnal, hiding in crevices or in foliage retreats from dawn till dusk. 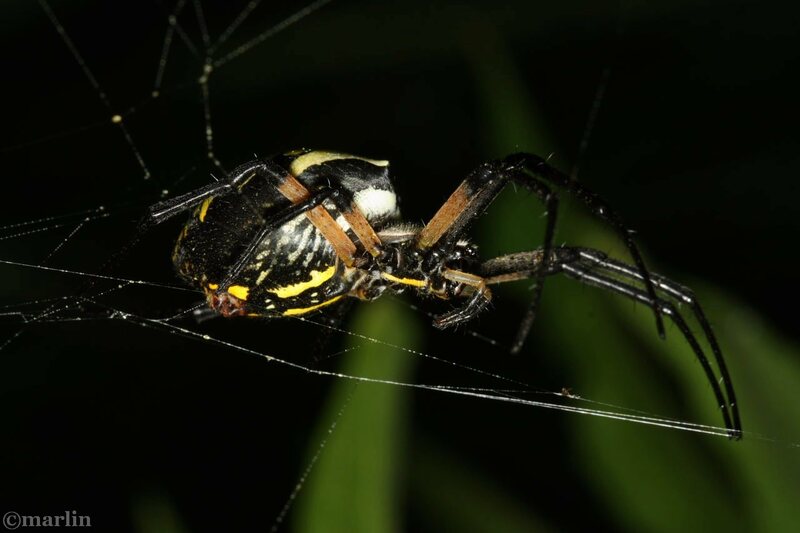 Black and Yellow Garden Spider – Argiope aurantia Also commonly called banana spider. Female Argiope (pronounced “are-JY-oh-pee”) are the largest spiders most people in the USA encounter. 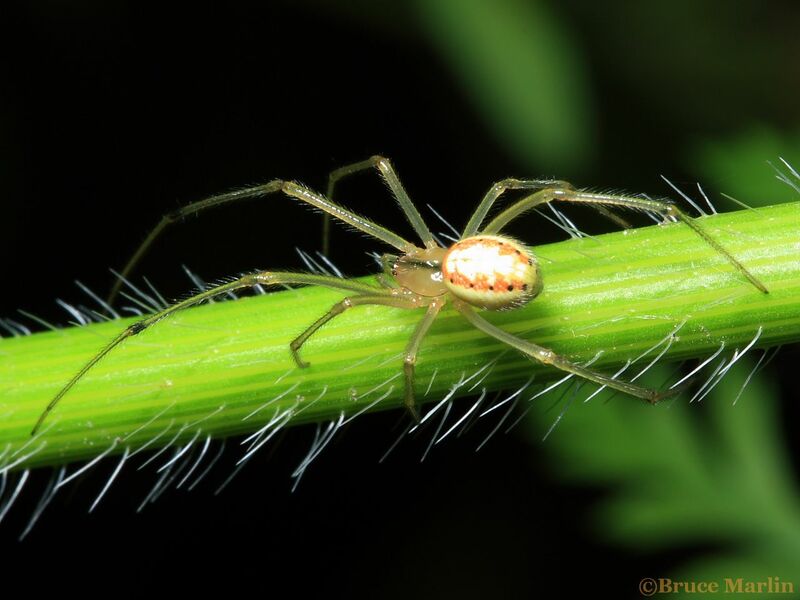 These charming creatures can be found in gardens and weedy fields from early summer to mid-Autumn, but become conspicuous only when they build their large webs toward the end of summer. 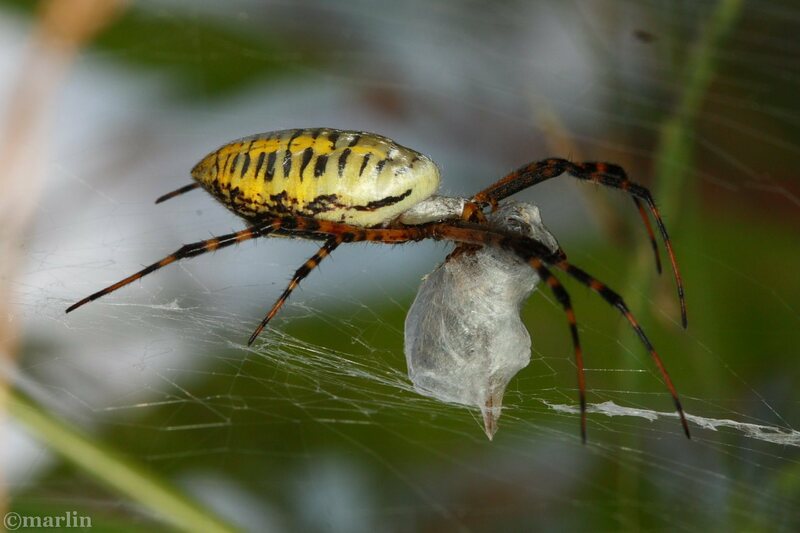 The eight legs of orb weavers are each tipped with three tarsal claws the spider uses to grip its silken strands. 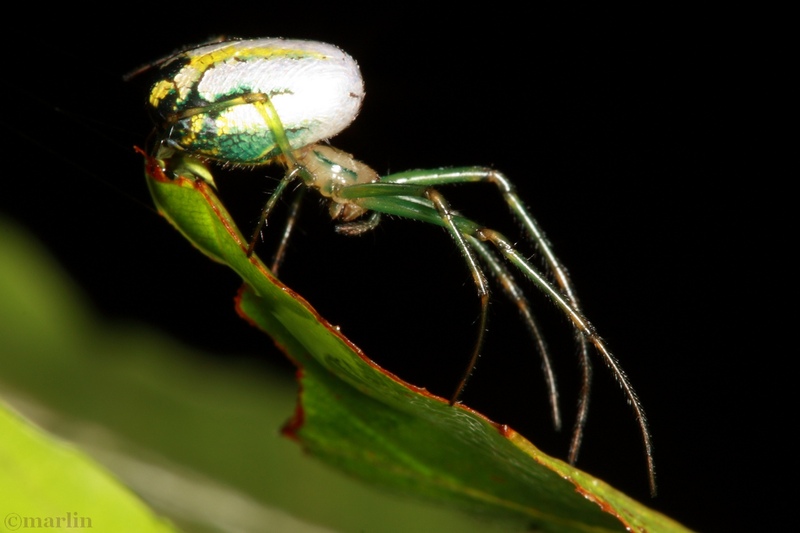 Venusta Orchard Spider Leucauge venusta are very small spiders that build their webs in the horizontal plane. They are nearly everywhere in low foliage, especially in temperate deciduous forest understory and just about any type of prairie. Here in northern Illinois, under the right conditions there can be thousands of spiders, every one with a web, in just the space of half a basketball court. Hint: look for them on a foggy morning with a slanting rising sun. Enoplognatha ovata looks like it should be an orbweaver, but it’s not. It’s a cobweb spider. Ha-ha! Fooled you! Marbled Orb Weaver Spider Araneus marmoreus What can I say? The stars were aligned when I met this gal. 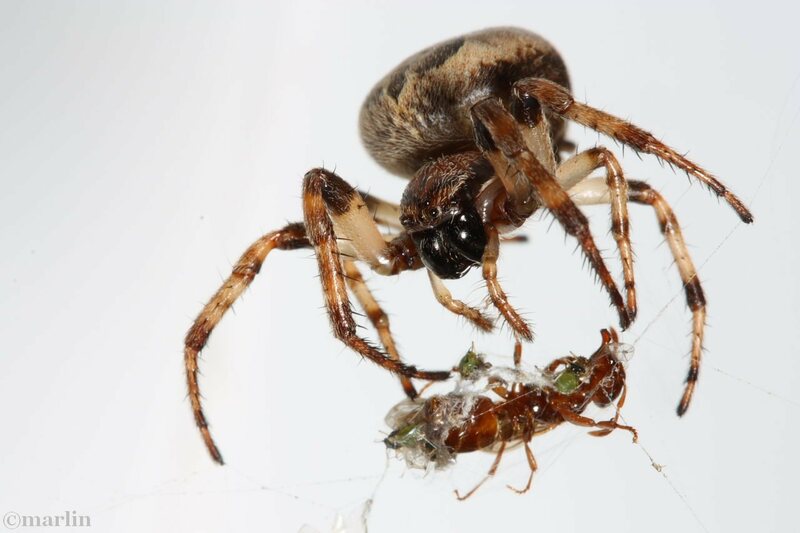 Normally I would go plunder the Wikipedia article on Araneidae for some interesting facts, but I’ll save both of us the trouble. 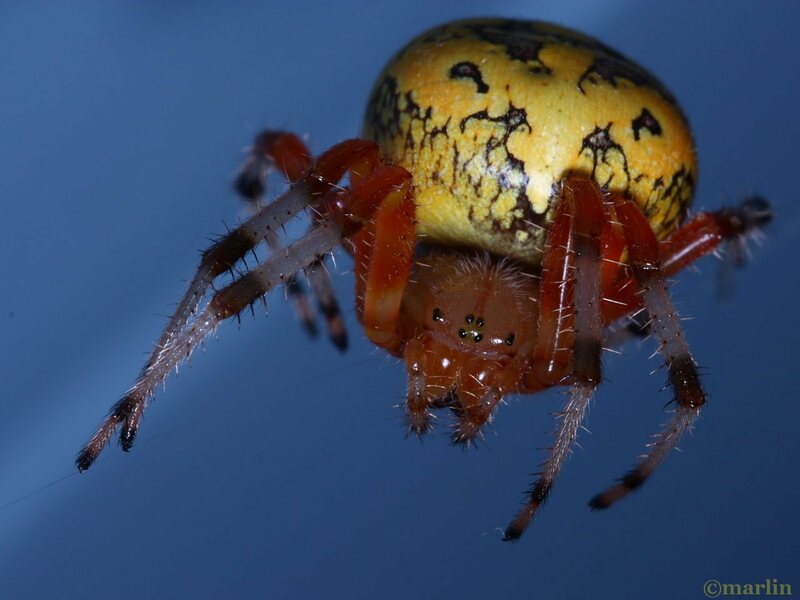 Wikipedia Araneidae. 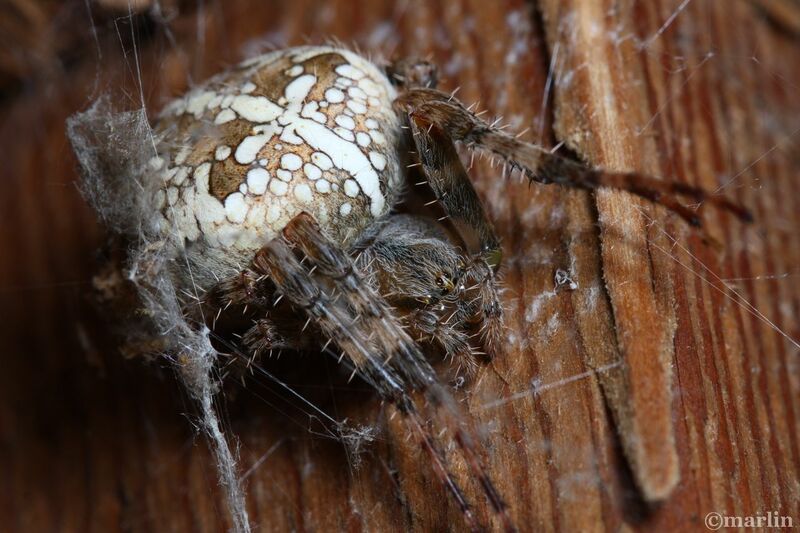 Neoscona arabesca – Arabesque orbweaver is a very common spider in yards and on structures. My neighbors all alert me to new specimens on their property and I’m happy to reassure them it’s a harmless beast and beneficial too. It’s a jungle out there! Tree Encyclopedia / North American Insects & Spiders is dedicated to providing scientific and educational resources for our users through use of large images and macro photographs of flora and fauna in their natural habitats.